Years ago, Wayne Nance's life was out of control. An incessant smoker, he weighed 315 pounds. His marriage was disintegrating and his finances were bottoming out. He finally realized that his obesity, debt and relationship meltdown were surface problems resulting from his core attitudes and beliefs. Then he began to bring his life back into balance. Today, Wayne is the "Real Life Attitude Guy." His true success story includes losing more than 100 pounds, staying married and paying off his financial debt that was ruining his life. 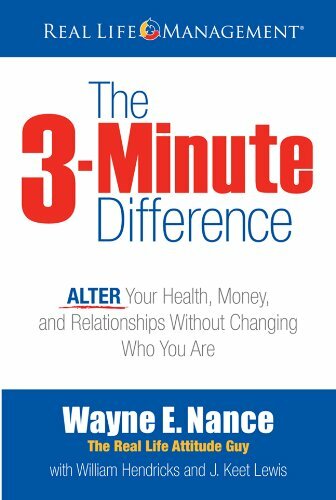 The Real Life Management system, outlined in this book, centers on the 3-Minute Survey. It will help you identify your core attitudes and then identify weaknesses, avoid faulty decisions and stay focused on your self-improvement goals.